Thanksgiving dessert doesn’t always have to be about pumpkin pie. Turkey is probably one of the most well known staples of Thanksgiving. In reality though, the desserts served rarely have to do a whole lot with turkeys! There is usually pumpkin pie and all kinds of other delicious goodies, but they aren’t very festive for the Thanksgiving holiday. This year, instead of just serving up the traditional pumpkin pie, I decided to do something a little different! 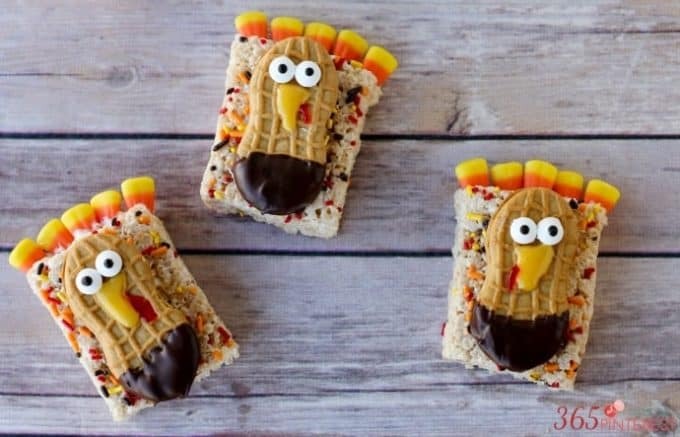 I put together this list of 25 turkey themed treats so you can serve something a little more festive this Thanksgiving! Any one of these would be a great addition to the classic pumpkin pie, but with a Thanksgiving twist! 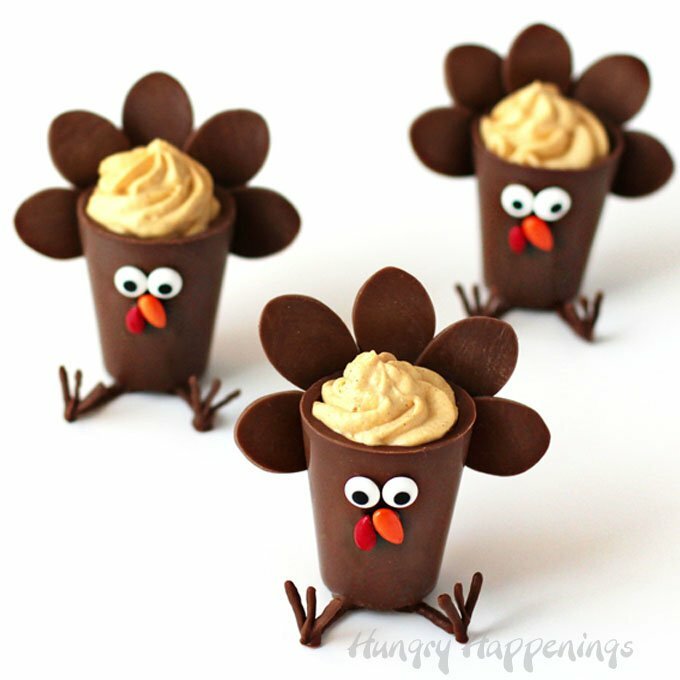 How cute are these little turkeys from Suburban Simplicity? They look so yummy and easy to make too. You’ll need candy corn, Reese’s Pieces (yellow ones), Rolos, candy eyeballs and pretzels. Head on over to Suburban Simplicity to get the recipe. 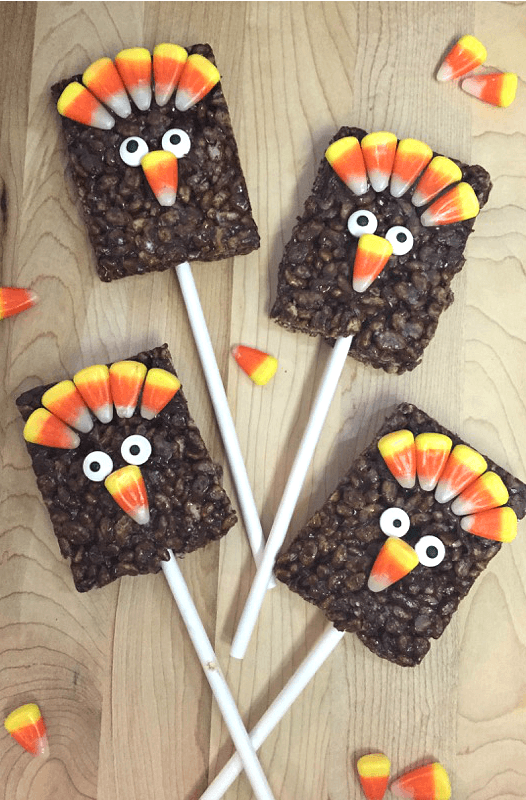 These Turkey Cookie Pops are sure to be a Thanksgiving crowd pleaser, especially with little ones. 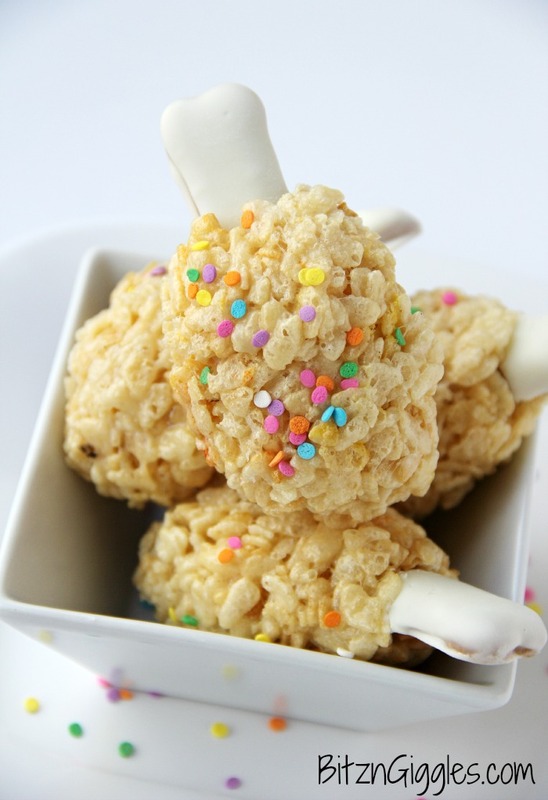 It’s surprisingly easy to make, all with prepackaged treats so you really can’t go wrong. Get the full recipe at My Crafty Life. 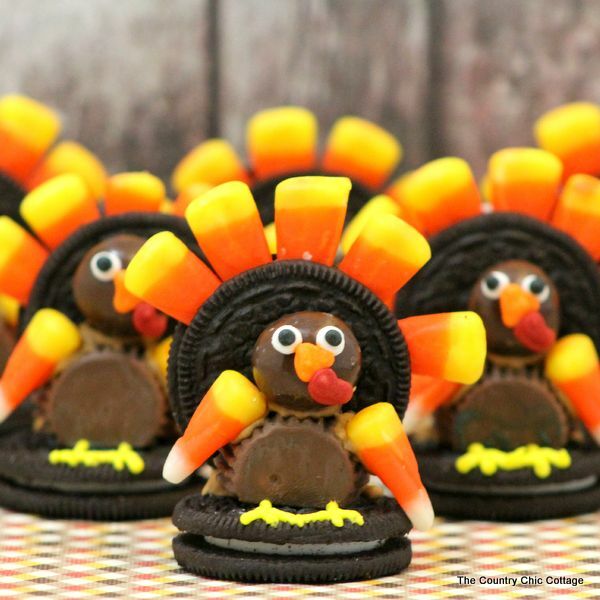 While these aren’t the cutest turkey dessert they win for the healthiest. 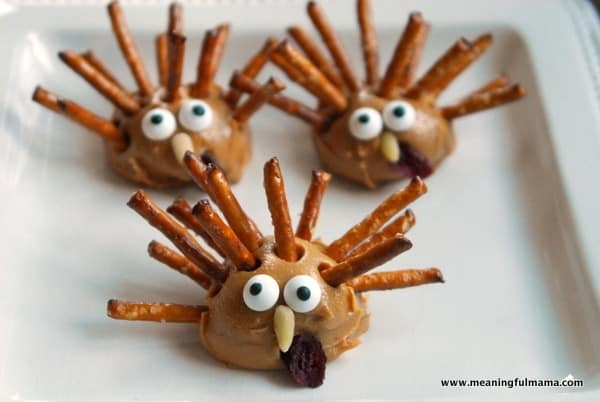 Use natural peanut butter, pretzel sticks, a pine nut nose, candy eyeballs and a Craisin. 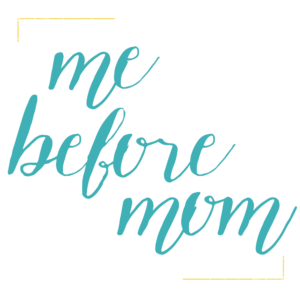 Grab the whole recipe on Meaningful Mama. Thanksgiving dessert doesn’t always have to be about the pie, sometimes you can do double duty for a Thanksgiving place setting and a sweet morsel. 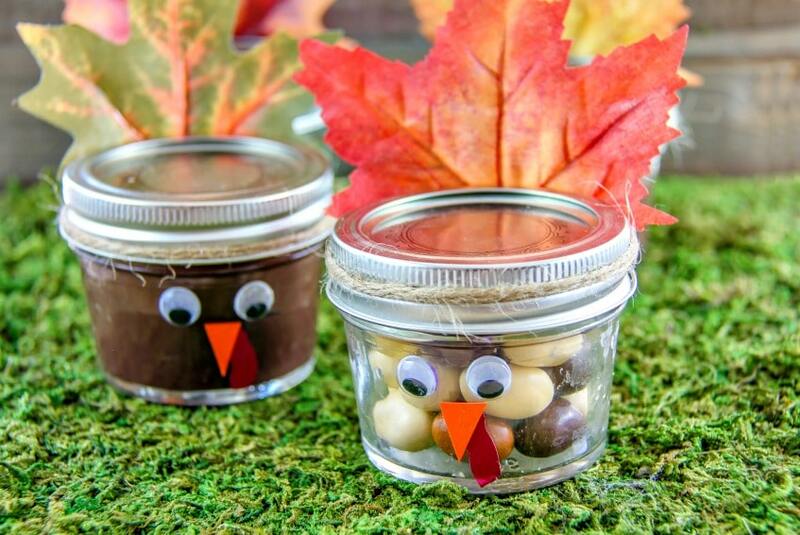 I love this idea to use mason jars and faux leaves, to make an adorable Turkey Candy Jar. Get the full instructions on Lady and the Blog. 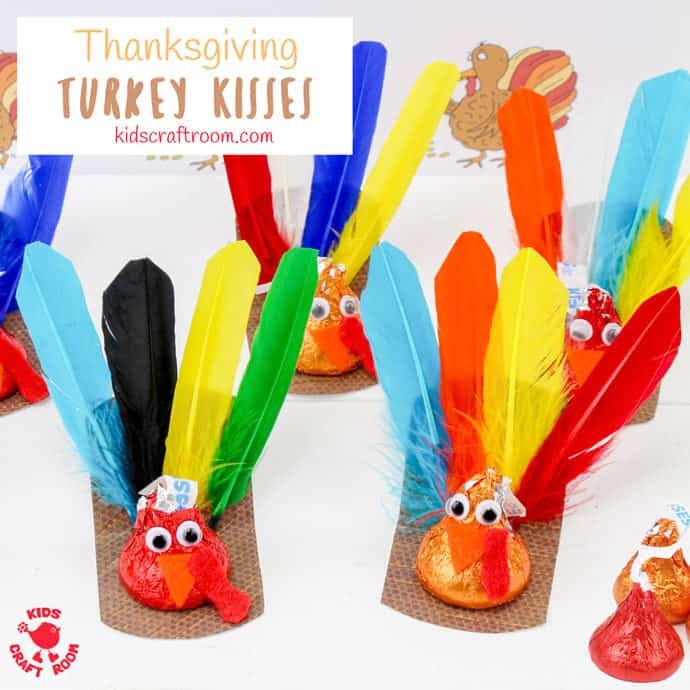 I’m hosting Thanksgiving dinner and my kids, niece and nephew are so going to be making these adorable Turkey Kisses. For a lady who doesn’t do crafts, this is one feathered craft I think I can handle. You can get the full instructions on Kids Craft Room. So we’re combining Reese’s Peanut Butter Cups and Oreos? 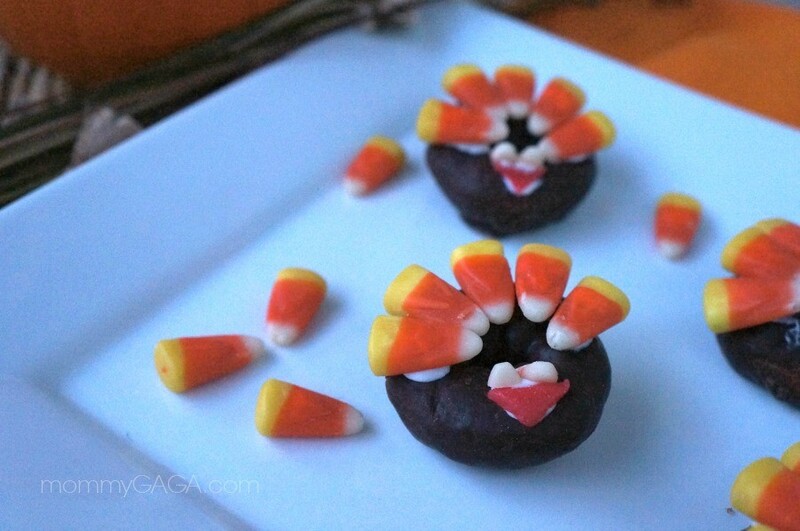 I’m in, no matter what, this is my kind of Thanksgiving dessert! Get the full recipe on Bitz & Giggles. 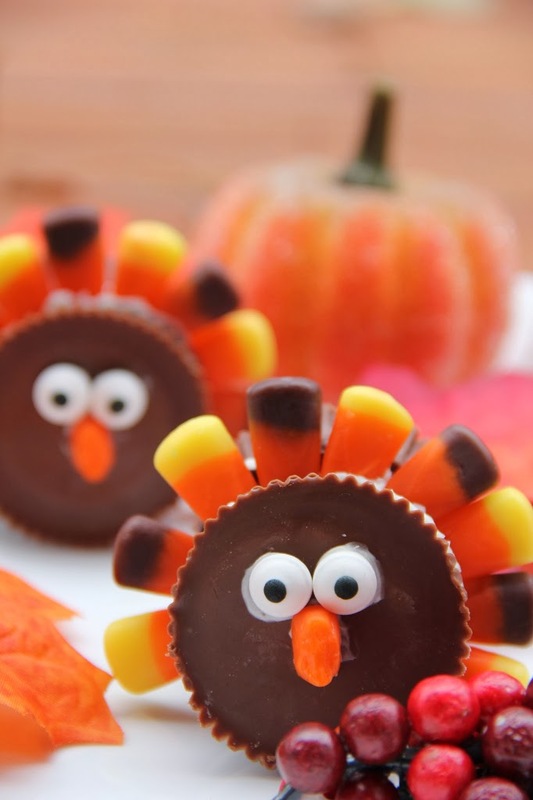 These would be so fun to give to the kids for a little Thanksgiving dessert take home. It’s really easy to make them as well. You’ll just need lollipops, some burlap, red craft foam, craft felt leaves or foam leaves, and googly eyes. Visit Crafty Morning for the instructions. These are so cute! 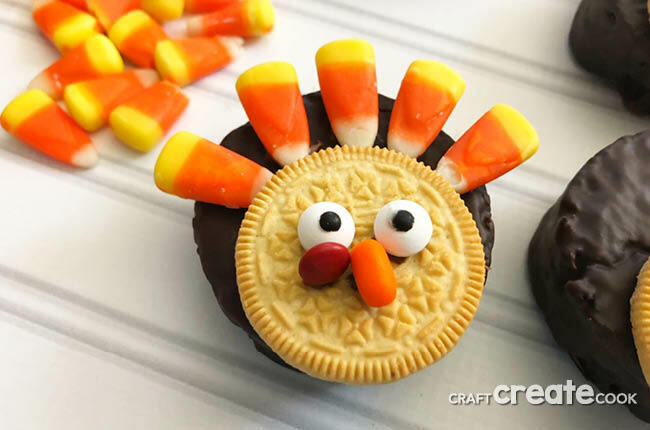 I think they’d be incredibly sweet but I know that my kids would love to have this festive Thanksgiving dessert sitting on the table. Get the rest of the instructions at Princess Pinky Girl. 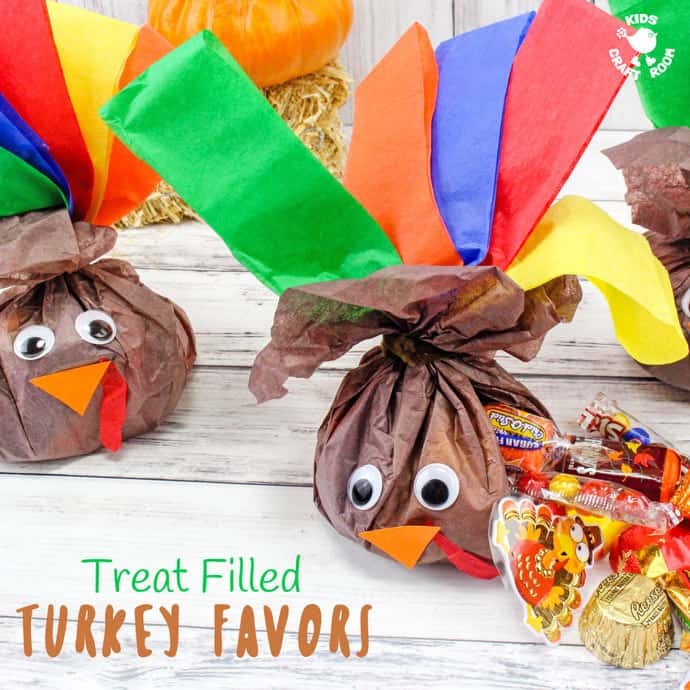 Be the ultimate hostess with the mostest with these fun favor bags from Kids Craft Room! Scooby Snacks, Rice Krispies and sprinkles! What more could you want? 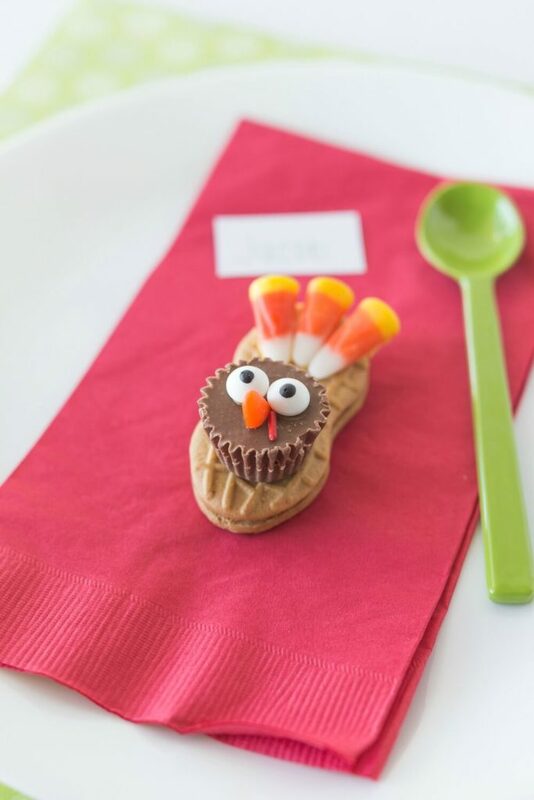 These Thanksgiving treats are so cute even the grown-ups will like them! 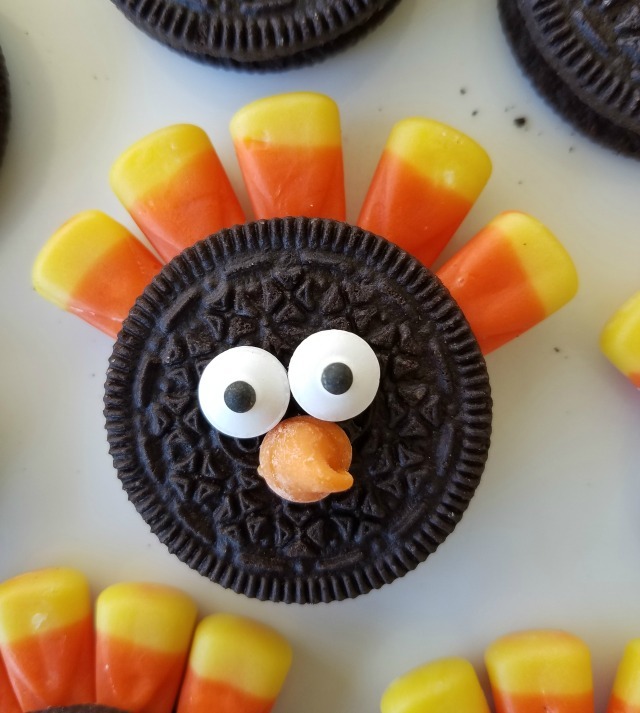 These are so adorable and the Oreos will make it so kid-friendly because they know what it is. Find the recipe here at Rocky Mountain Savings. I know, a LOT of these recipes have Reece’s Peanut Butter Cups but can you blame people for using the best candy ever? Visit Walking on Sunshine Recipes for the recipe. While these certainly look tasty they may be a little intricate to the average baker like myself. I’m going to try this one out before Thanksgiving Day. Visit Crafty Morning for instructions. Anytime you have the phrase “no bake” I’m instantly interested. Get the instructions from Craft Create Cook. These are just too too cute!! They look really complicated, however, the instructions from Hungry Happenings is thorough so I think that things could come together easily. 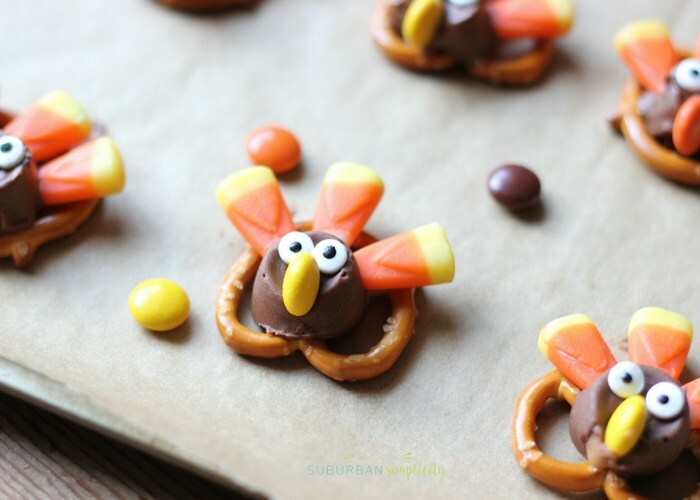 I love these easy to make chocolate covered Pretzel Turkeys, don’t you? 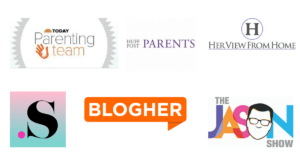 Plus, they come from my blogging friend Alison at Everyday Shortcuts. Check out the instructions on her blog. 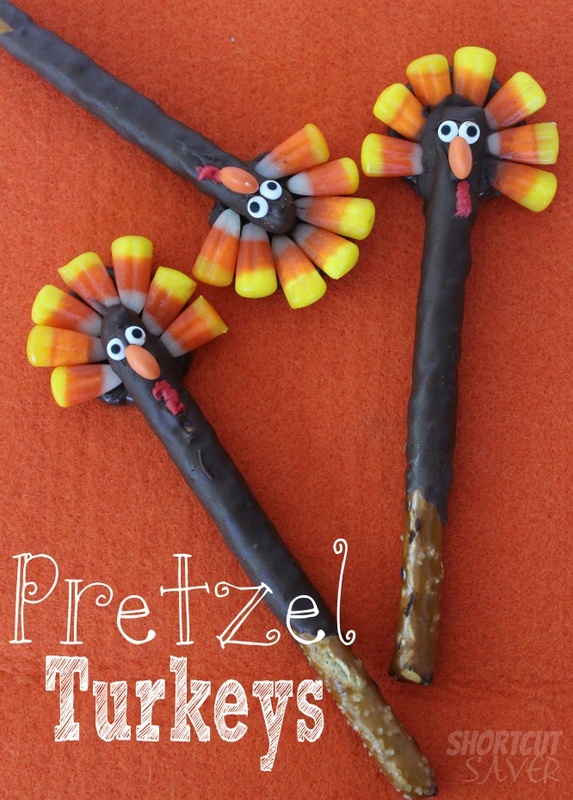 These look a little complicated but then again, I think if you were to find a method to assembling Turkey Treats it could be easy. Lucky for us, the tutorial and supplies can be found over at The Country Chic Cottage. 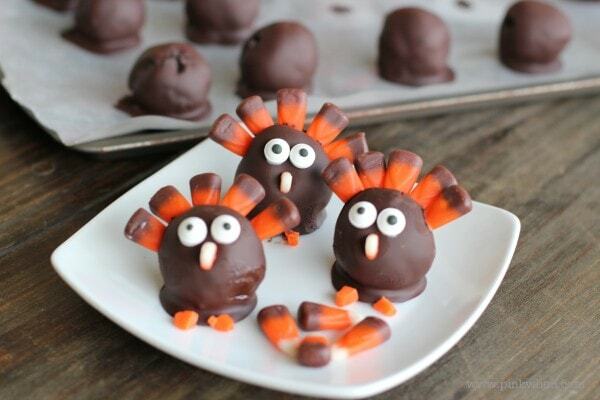 I love OREO cookie truffles, the cream cheese that’s used to make the little turkey balls makes my mouth water. You can find the instructions how to make these over on Pink When. Not every dessert has to be handmade, right? 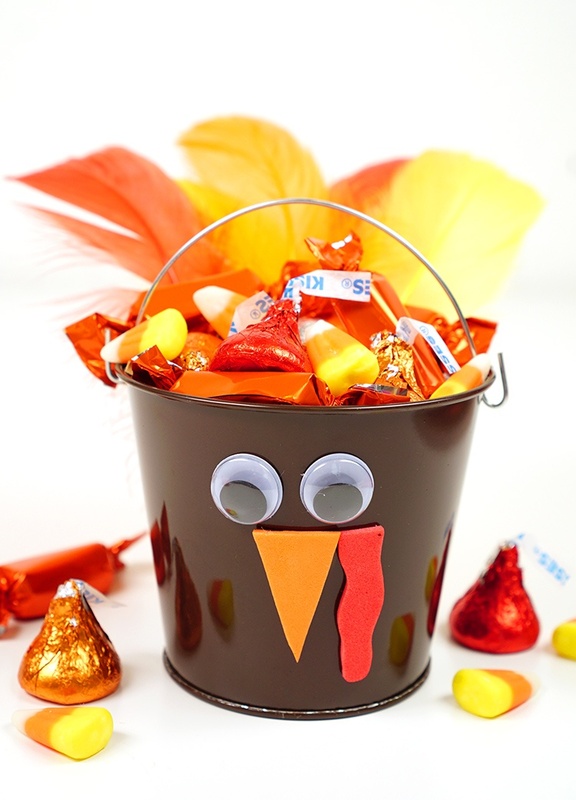 I love the idea of using a bucket, decorating it and then filling it with goodies for the kids who will be at your Thanksgiving dinner. Get the entire idea from Happiness is Homemade. These look similar to a treat I shared with above, however, it’s the more simple version. I like it because if you want an adorable treat that also tastes sweet this treat has it all for you. Get the full tutorial from Somewhat Simple. This is a take on the classic chocolate, caramel, pecan treat, The Turtle. Only, it’s Thanksgiving style. 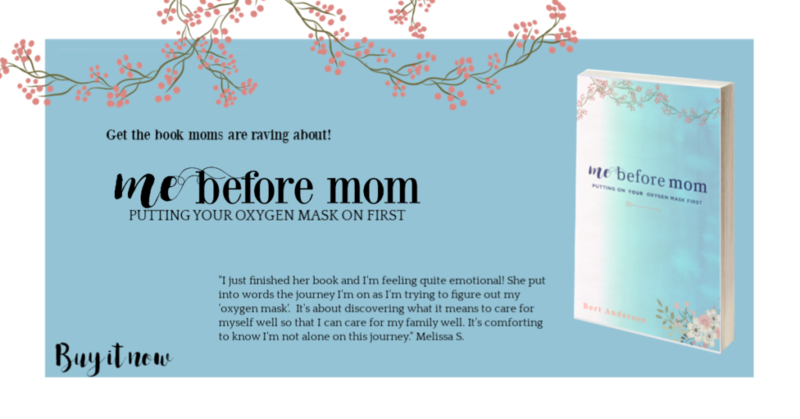 I like where this blogger is going and you can get the full tutorial on Kid Friendly Things To Do. 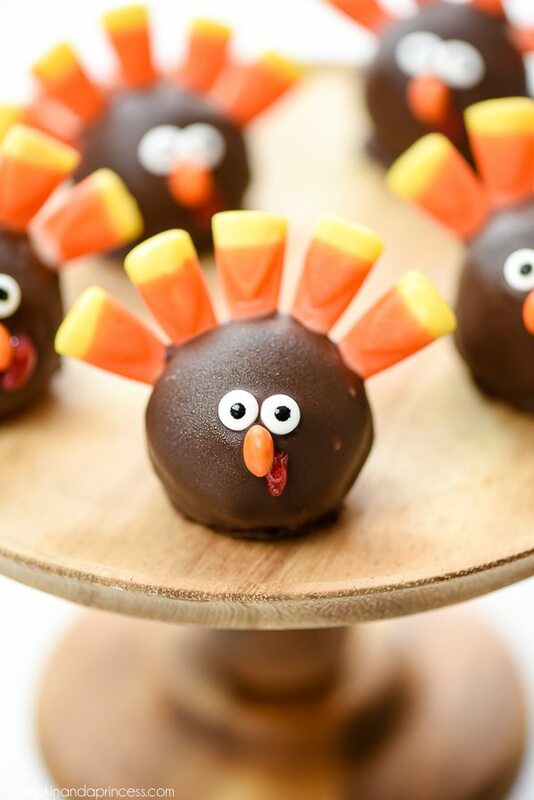 These are so cute and I think I could actually pull this Thanksgiving treat off! Grab the instructions from Honey and Lime Co. When I think of Thanksgiving turkey desserts I think of Nutter Butters. They’re the perfect shape for a turkey. Get the full tutorial over on I Heart Nap Time. These are easy to make and really quite adorable. Plus, can you ever go wrong with donuts? No, no you cannot. Get the instructions on Honey and Lime Co.
Another tasty OREO cookie ball and I am all for it! Just in case the first one I shared with you wasn’t your style check out this recipe from A Pumpkin and a Princess. Here’s wishing you, your family and friends a happy Thanksgiving and please, let me know if you’ve tried any of these tasty Thanksgiving turkey desserts!